The excesses of Christmas have passed, the mounds of chocolate and carbs are gone. Might you consider a vegan meal as one of your first of 2017? The Peacock has sat opposite the Victoria Centre on Mansfield Road for some time, yet didn’t seem to warrant a second glance until last year when it overhauled its menu to be 100% vegan. 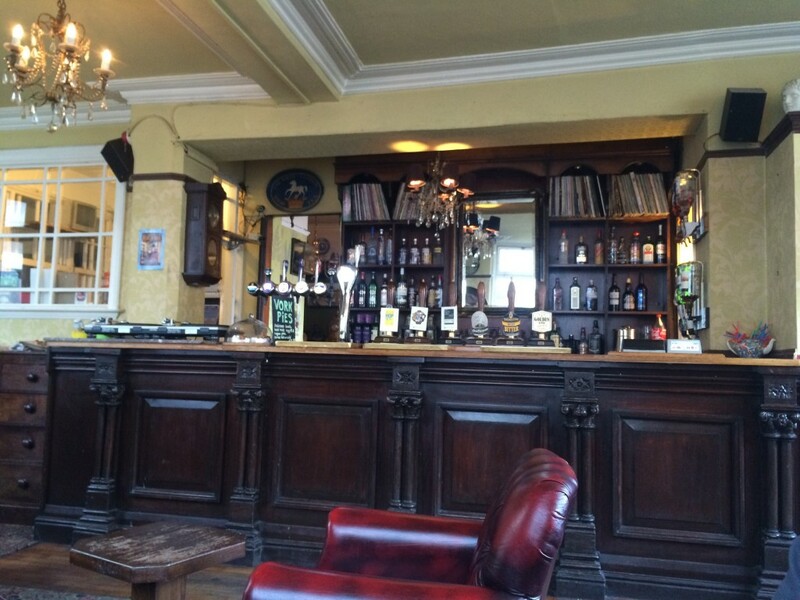 It is still very much a pub bustling with what would appear to be a traditional clientele of a city centre boozer. The music is played on vinyl and on the Saturday night I visited we managed to sneak the last available seats. The menu is quite casual, sandwiches and light bites, as well as a handful of more substantial dishes. 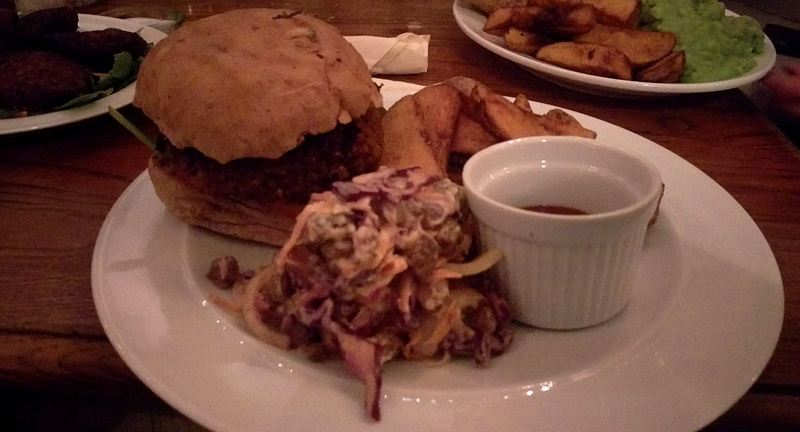 We went straight for main courses and I had the Seitan burger at £6.95. For those not in the know (which included me) Seitan is a meat substitute made from gluten. The flavour was nice, mostly derived from the burger relish, however the texture was unpleasant – the bun and burger seemed to meld into one. The chips were excellent so kudos for those, the coleslaw fine too (apart from having raisins in it, which is unacceptable in my book*). The main positive was probably the size of the portions, all the meals people had seemed excellent value for the modest cost. Apologies to everyone for my dismal picture, hopefully getting my worst for 2017 out of the way early. The main that was most exciting was picked by the vegan friend of my girlfriend, whose visit was the occasion for our meal at the Peacock (incidentally I need to apologise to her for asking her questions about veganism and staring like someone’s first trip to the zoo). She had fish and chips which I understand is not a common dish to find on a vegan menu. It looked the part and like the other dishes was sizeable to say the least. The fish was a meaty chunk of tofu wrapped in seaweed to give the flavour of the sea. The batter that then surrounded it was crispy and well-seasoned. I don’t imagine there is much more you could do to get a vegan fish and chips reminiscent of the original. As a meat eater I struggle to assess vegan food. When you have had the real deal in meat and dairy it is difficult to compare. Our vegan dining partner was suitably impressed and pleased with what was served up. I like The Peacock for its atmosphere, I offered an old man drinking Guinness one of my chips as he gazed longingly at my food, despite their adverts not something I would do in McDonalds. The fact it’s a pub doing something different means it deserves that second glance it didn’t previously get. Café Roya is probably still the most interesting food of this type in Nottingham but its positive that more choice is out there. Something vegans rarely having the luxury of.